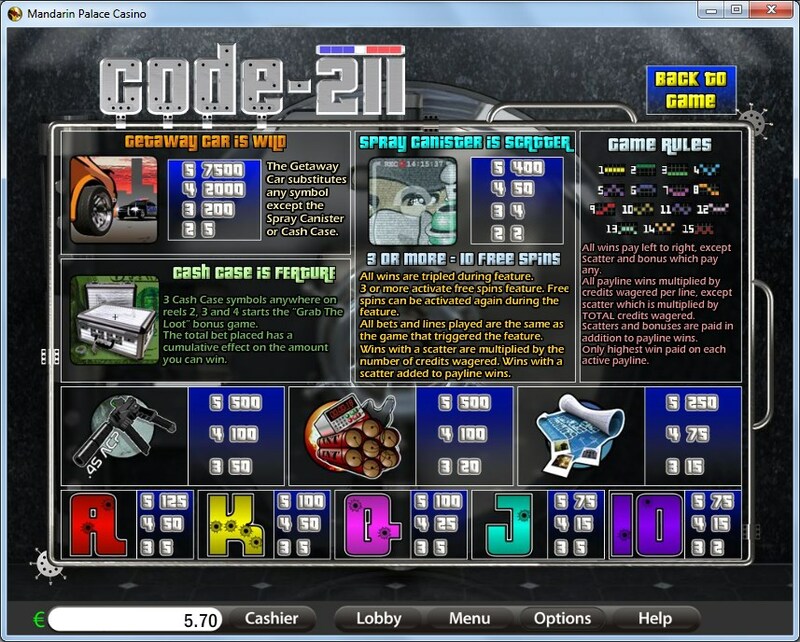 The title of Code – 211 seems to refer to a police code which mentions a robbery, and that’s pretty much what you see on the reels of the game as well. A bank robbery is taking place there by the looks of it. The theme is far from an original one, but it can still be entertaining if it’s done right. Did Saucify, the game’s developer, did a good job with this game? Keep reading and find out. With 5 reels, Code – 211 only gives you 15 bet lines, but it does better with the various features provided, including bonus games, free spins, scatters and wilds. Prizes of $15,000 can be awarded inside. 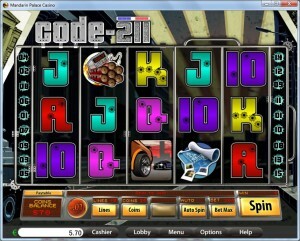 Along the way, as you play this game, you will get two scatter symbols, free spins, a bonus game and wilds. First, let’s take a look at the Getaway Car symbol, which is used as the wild in Code – 211. It is capable of substituting for another symbol, though obviously it first needs to appear in exactly the right spot in order to do that, and the rest of the icons needed for the combo have to be matching ones. Multiple wilds together, from left to right, will form a combo of their own, and paying as much as 7,500x. The wild can’t substitute for the other two scatter symbols. 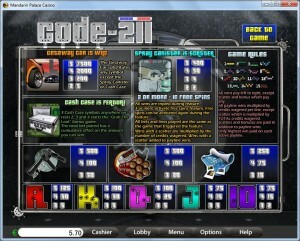 The first of the scatters is the one that gives you free spins and cash prizes. The prizes require 2 or more scattered Spray Canister symbols. The payouts offered by them will vary between 2x and 400x the total bet. When 3 or more Spray Canisters are present on the reels, as scatters usually are, in random positions, you will receive 10 free spins from them. All the wins you get along the way will be tripled by the accompanying multiplier. Activating the free spins again while the current ones are running is possible, and all you need to do is get the 3+ scatters again. A bonus game was also introduced in the game, and it’s called Grab the Loot. It needs the Cash Case scatter to appear in a minimum of three locations during the same round. If that happens, you get into the bonus game. The new screen gives you a room where safety deposit boxes are placed, and where you have two bags of cash and three cases to choose from. You have to pick only one item to take with you. The game uses a lot of coins per line, 20 of them for each of the 15 lines, making you wager with as many as 300 coins total. A coin’s bet range is between $0.01 and $0.10, and with 20 selected the line bet reaches $2. The total bet is $30. Since the wild promises a 7,500x payout, that’s up to 150,000 coins to you, but only $15,000 cash. The game has a certain cartoon style which looks dark and inspired by the movies from games like GTA. The symbols include letters of various colors, the only themed part about them being the bullet holes which they all have. The themed icons are my favorites, but they will be in minority on the reels in most cases, since they’re also the ones that pay best. Symbols: Getaway Car (wild, 7,500x), Spray Canister (400x the bet, scatter), Cash Case (scatter), .45 ACP Gun (500x), Dynamite Bomb (500x), Blueprints (250x), Ace (125x), King (100x), Queen (100x), Jack (75x) and 10 (75x). The cob and robbers theme isn’t a favorite of mine in this case, but the features do look good, and the 7,500x payout is a decent jackpot. 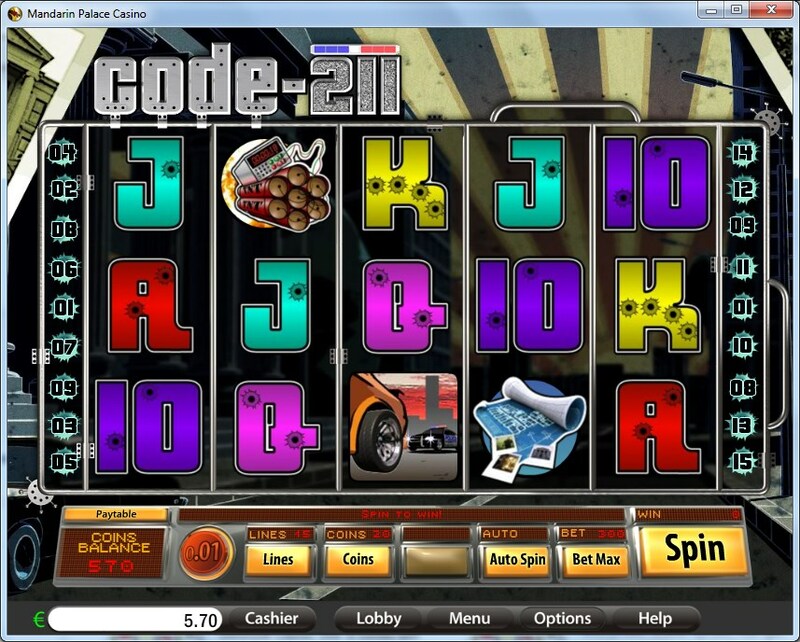 This Code – 211 slot is offered by all online casinos with Saucify/BetOnSoft software, playable either in practice or in real money mode.